Modern bike share has grown into a successful business all over the world in the past 7-8 years. Traditional U.S. bike hotspots such as Denver, CO; Portland, OR; Minneapolis, MN; Washington, DC; Chicago; and New York City have well-established docked bike share services. This means the rental and fee structure depends on bikes being rented from and returned to docking stations, with high fees charged for keeping the bikes longer than 30-45 minutes, and even more astronomical “abandonment” fees for leaving bikes undocked. Docked bike share systems depend on being able to locate a bike to rent and finding a station with a vacant dock to park the bike to end the rental charge. In busy cities like Washington DC, finding a vacant docking slot can be a problem at peak times in certain popular retail/restaurant neighborhoods. There over 120 cities across the U.S. that have bike share programs, large and small, the vast majority are traditional docked systems, all started in the past 7 years. New this past year is a type of “dockless” bike share in a number of U.S. cities. The new dockless system must not be confused with older “Yellow bike” fleets, often deployed on college campuses. These usually short-lived shared-bike efforts were unsuccessful as the fleet dwindled due to equipment failure, theft, and abandonment. Modern dockless bike share utilizes GPS on every bike and user-friendly smartphone apps that locate bikes near you. The great advantage of dockless bikes are that they can be parked anywhere; you needn’t search for docking stations, thus minimizing walking and time. This benefit of dockless bike share is also its bane in cities where there are thousands of bikes. The bikes are left anywhere, on sidewalks, in streets, and often in the way. Dockless bike share was recently piloted in Dallas and Washington, DC, in a big way. Five dockless bike share companies brought thousands of bikes to DC, all competing with the well-established Capital BikeShare. There are an estimated 20,000 dockless share bikes in Dallas! Both traditional and dockless systems feature bike lights and electric or e-bikes in many markets. Dallas and DC are very different metro areas. Dallas is a spread-out city where most everyone has a car, there are few other convenient transportation choices, and few people regularly bicycle. DC is a compact, “densely occupied” metro, where many people are “carless”, so they walk and bike, as well as use the Metro subway trains and buses, because it’s faster, less expensive, and more convenient than driving and parking a car. Participants at the National Bike Summit (NBS), March 3-5, 2018, in Washington, DC, were able to demo several dockless share bikes and compare them to the traditional Capital BikeShare. I was able to do this and am now a fan of dockless systems. They worked great in busy DC! Download the app(s) you choose to your phone. Create an account and link a credit card to it. Ride the bike, then park and lock it when finished, to end the rental. The timers on the bikes reset every time they are locked, this can be anywhere. Enter a code provided by your app, on the bike to unlock it. Ride the bike, then re-dock it at a bike station, to end the rental. Usually, there is an additional fee if the bike is ridden for more than 30-45 minutes. Believe it or not, Alabama will be a test bed for three versions of bike share in 2018. In Alabama, there are a couple of bike share systems already and a new one coming to Mobile this fall. Different systems fare better in different metro areas for many reasons, such as; climate, terrain, population, density of population, and age, such as the younger population of university towns. The three types of bike share described below all have their pros and cons. But, the three choices in Alabama system architecture are more due to the chronological order of their introduction, indicating rapid technology evolution, thanks to adaptation of technology and design as bike share matures. Birmingham: The first to invest in bike share in October 2015. Zyp BikeShare, the initiative by REV Birmingham, put 400 bikes on the streets of the Magic City, at 40 docking stations. Users may buy annual memberships or pay for a single day. The phone shows nearby stations in an app; Birmingham looks like the figure here and similar graphics are used for most docked bike share systems. A $2 million federal grant for congestion mitigation and air quality improvements, along with a 20 percent match from the city, made the program possible. The program's sponsors include Regions, Blue Cross and Blue Shield of Alabama, Alabama Power Foundation, and the Community Foundation of Greater Birmingham; and REV's partners include the city, the Regional Planning Commission of Greater Birmingham. 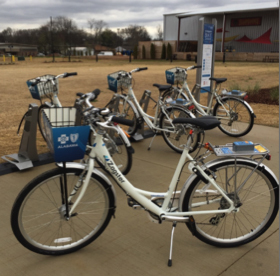 Huntsville: In March of 2017, the City of Huntsville and Downtown Huntsville Inc. launched the Zagster Downtown BlueBikes presented by Blue Cross and Blue Shield of Alabama with about 80 bikes and 8 stations. Zagster bikes are nicely designed urban cruisers that are lighter weight, more comfortable and offer more adjustment to fit most people than traditional heavy-weight bike share. Also, Zagster bikes come with an on-board lock that allows the user to leave the bike safely locked in a location other than one of the stations. This “semi-dockless” system is designed for smaller or less densely populated cities, but the rental fees continue until the bikes are returned to a docking station, albeit at lower rates than most traditional docked systems. Mobile: This fall, Mobilians on the go are awaiting the arrival of a dockless bike share, known as LimeBike. “There is a strong demand in the City of Mobile for more transportation options,” Mayor Stimpson said in a press statement. LimeBike is already in 45 other cities nationwide and will be dropping 500 bikes throughout the Mobile — primarily downtown and at the University of South Alabama campus — starting in August, 2018. The mayor also stated that there will be no cost to the city. Comparing the millions invested for Birmingham’s and Huntsville’s bike share systems, it is quite a change for Limebike to provide bikes, albeit simpler and less robust, at no cost. How does this compute? First, there are no heavy duty, all-weather bike stations or payment points. Fees are all collected electronically, taking advantage of phone apps, GPS, and scanning capability provided by phone cameras. Additionally, there is no land leasing or purchase for bike stations. And finally, labor to continually move bikes from station to station is minimized greatly. But, losses due to theft and equipment failure will be higher with a lighter-duty dockless fleet. Only time will tell which systems will survive in Alabama and other U.S. cities.